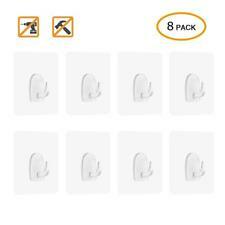 24 Pc Reusable Wall Hooks Transparent Hangers Decorate Removable Home Office !! Hang almost anything under 5 Lbs on any sealed, non-porous surface, such as tile, wood, stainless steel, linoleum or glass with the stick up reausable hooks. Decorate, get organized with these versatile hooks in your home, bathroom, office, o work space. Stickup reusable hooks used advanced micro-suction technology to hold just about anything with no nailing, no screwing and no mess. 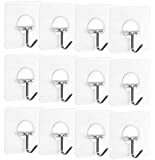 This listing is for 24 piece clear hook set (2 Packs), includes: * 12 Pc large hooks 4" x 4" * 12 Pc medium hooks 3" x 3"
EASY PEEL TAB FOR ON/OFF APPLICATION: Simple to use peel tab, peel and press for easy attachment; peels off cleanly when ready to remove; will not damage walls or leave unsightly residue behind. WORRY FREE MULTI-ROOM DECORATING: Use these non-permanent wall fasteners to decorate any room in the house; securely fastens to most non-porous surfaces: smooth tile, finished wood, glass, painted drywall, or metal. SMALL BUT STRONG: Holds up to ½ lb. per hook; perfect for keys, jewelry, pet leashes, potholders, clutches and other lightweight items; can even be used to create wall collages. ORGANIZE AND DECLUTTER: With a modern sleek design and on trend colors, these wall hooks are perfect for the modern home, office, or dorm room; adds seamless style with their subtle appearance. NO HAMMER OR NAILS: It's the simple way to decorate or organize on multiple surfaces without putting holes in the wall; available in various pack sizes to meet your decorating needs. 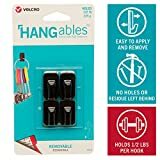 VELCRO BRAND HANGABLES REMOVAVABLE WALL HOOKS Trust the VELCRO brand name when it comes to hanging lightweight items on various surfaces in your home. These easy-to-apply, wall hooks are strong and stay firmly in place once set. 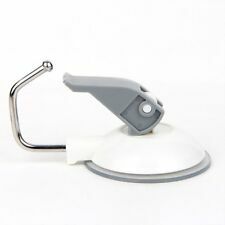 Perfect for most rooms in the home, they securely adhere to non-porous surfaces like smooth tile, finished wood, glass, painted drywall, or metal so you can use in the kitchen, bathroom, home office, mud room, or anywhere an extra hook is needed. 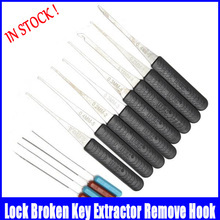 And best of all, these damage-free hooks are easy to remove as well. The non-permanent fasteners will not mark or leave residue behind when it’s time to remove them. You have options when it comes to our new range of VELCRO Brand HANGables Hooks. Ideal for indoor use, select from an array of trendy and modern colors for a seamless removable adhesive fastening solution. 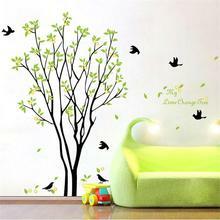 Enhance any room with ease - no hammer or nails necessary. It’s the simple way to decorate or organize on multiple surfaces without putting holes in your wall! Command Small Designer Hooks, White, 2 Hooks, 4 Strips. Command(TM) Hooks are available in a wide range of designs to match your individual style and decor. They also come in a variety of sizes and hold a surprising amount of weight - up to seven and a half pounds! Forget about nails, screws and tacks, Command(TM) Hooks are fast and easy to hang! Using the revolutionary Command(TM) Adhesive, stick to many surfaces, including paint, wood, tile and more. 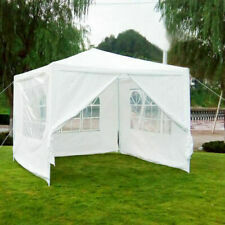 Yet, they also come off leaving no holes, marks, sticky residue or stains. Rehanging them is as easy as applying a Command(TM) Refill Strip, so you can take down, move and reuse them again and again! Size:5*0.8 inches;Made of small tree branches as Adhesive Hooks Clothes Coat Hook,Key Holder Hook,Curtain Rod Holder,Hat Holder,Bag Hanger Hook,Home Decoration.. Both useful and unique:100% wooden material,all wood holders just a little different which gives them character and makes them unique.each package includes three hooks..
Ultra Strong 3M pretaped adhesive bear weight up to 106 oz for each rack,The hook is made up of the imported 3M adhesive,you do not need to worry about when it will be off glue..
Easy to intall:Don't need tools or damage the wall,keep the surface smooth and dry,then stick and press for 1 minute.At least 24 hours later,you can hang your accessories.. Wide Application：Works on a variety of surfaces,like wood,tile,and more.Ideal for bedrooms,closets,cabinet,kitchen,office,armoire and so on to save space and organize your space in neat.. 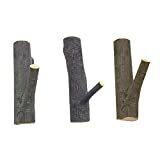 Description These Small Tree Branch Wall Hook are very unique holders,Using real branches of different sizes and turning them into hangers.you can use them for keys, but also they could be used for lightweight jackets,curtains,kitchen towels,pot holders,jewelry,etc.They look like they were cut from a tree,and have different circumference "twigs" for items.besides,they are a lovely organic looking decoration and definitely something different.If you have a nature inspired home, you will love this product! Feature - These are attractive & useful hooks. No more hunting endlessly for keys. - Beautiful natural wood hooks that offer an earthy feel with a very utilitarian purpose. - Strong tackiness to adhere to the wall,perfect for Hanging hats, headphones,coats, jewelry or towels and gadgets,etc - Great for rustic wood themed bedroom bathroom kitchen,a nice rustic and natural decorative product. - The item can work well on the surface of siding,ceramic tile,glass,refrigerators,washing machines and metal - They are about the same height but not the same thickness because it is real nature wood. 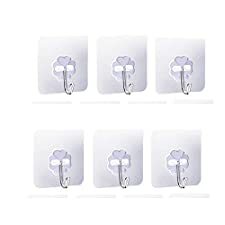 Package Included: 3 x Adhesive Wall Hooks How to best paste the 3M Hook: Step1: Please choose the spot with care,it's not removable due to its strong stickiness Step2: Please keep the surface dry and dust-free before you pasting the sticker. Step3: Press it properly for 30 seconds and waiting a few hours before using. Step4: Please wait for 24 hours before you place something.